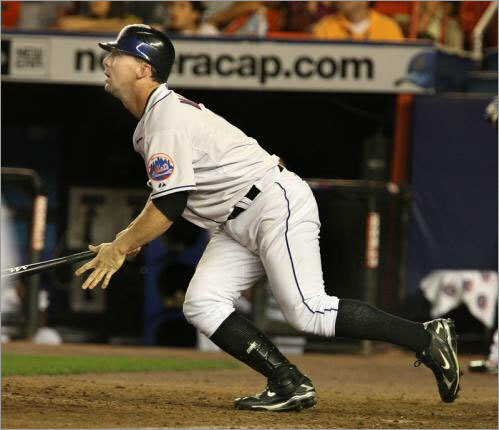 (Globe Staff Photo / Stan Grossfeld) Trot Nixon, a beloved member of the Red Sox for 10 years and part of Boston's World Series team of 2004, is back in the big leagues this season with the New York Mets but recently landed on the disabled list. NEW YORK - The Mets are en route to an 11-0 beating by the lowly Seattle Mariners at Shea Stadium. Starting pitcher Oliver Perez is getting booed mercilessly. His luck goes from bad to worse when he gets drilled trying to lay down a sacrifice bunt. He lies in the dirt, writhing in pain, as the umpire signals a strike. When he returns to the bench, only one player gives him a pat of encouragement. The newest Met, Christopher Trotman Nixon. "He's a great spirit," says Mets pitcher Pedro Martínez, Nixon's teammate on the 2004 world champion Red Sox. "It's going to rub off on the other players that you've got a great teammate that's going to keep everybody upbeat. A great hustler and also a very good player. Very steady on defense." With three outfielders on the disabled list, the Mets desperately needed a lefthanded bat. They gave Trot Nixon his greatest Father's Day present. A ticket from Tucson in Triple A back to the Show. "I love it," he says. "Obviously, I'm playing at the major league level with a very competitive and talented team. I'm very lucky to have the opportunity to come to a team like this. The sky's the limit." Nixon grew up in North Carolina, following the Mets on cable television. "That's when they had [Lenny] Dykstra and [Darryl] Strawberry and all those guys," he says. "I was a huge Dykstra fan when I was younger. I just liked the way he approached the game, and here I am playing in the same ballpark as most of these guys. So it's exciting for me." Nixon, 34, who was sent to New York June 13 for cash or a player to be named, failed to make the Diamondbacks this spring and was assigned to the Tucson Sidewinders of the Pacific Coast League. He was hitting .309 with 39 runs, 15 doubles, 10 home runs, and 31 RBIs in 58 games, mostly in left field. But things have started slowly with the Mets. Since going 2 for 3 in his debut, on Father's Day against Texas, Nixon has struggled. He's hitting just .156 in nine games with one home run and one RBI. "I kind of started out a little slow offensively, but sooner or later, I'm going to break out of it, " he says. It had better be sooner. The Mets, with left fielder Moises Alou (calf) and right fielder Ryan Church (post-concussion syndrome) and reserve outfielder Angel Pagan (shoulder) sidelined, need help now. "They haven't said anything, but I understand the possibility it might be short term," says Nixon. "But you know, wherever I'm at, I want it to be a positive experience for myself and the guys that are around me. And I'm going to go out and produce." Manager Jerry Manuel says Nixon is probably pressing but he loves his gritty play. "He'll be fine," says Manuel, who recently took over for fired Willie Randolph. Nixon says he doesn't need pep talks. "I don't expect people to have to say a lot to me," he says. "I understand why I'm here and I understand what I need to do. I just got to go out and get it done whenever my number's called." In 11 major league seasons, Nixon was a .275 hitter with 136 home runs and 554 RBIs. He was drafted in the first round by the Red Sox in 1993 and remained with the team through the 2006 season. He spent last year with Cleveland, but his batting average dipped to .251 with less playing time in right field. But against the Red Sox, he batted .455, including the winning single in Game 2 of the American League Championship Series. Cleveland released him after the season, and only Arizona invited him to spring training. But Nixon hit just .214, and when Arizona broke camp, he was left behind. Martínez, who calls Nixon "Trotty Loco" or "Crazy Trot," has a ton of respect for Nixon for battling his way back to the big leagues. "I talked to him," says Martinez. "I just don't think he's done. He's got a lot of baseball in front of him. And he said he just wanted to stay in baseball; that's why he went down. He wanted to make it back and get another opportunity, and I'm glad he did because it looks like he still has all the tools that he did previously. When he finally gets his groove, I'm pretty sure he's going to do better. I think this is the kind of place - like Boston - that can appreciate him." There weren't enough fans in the stands to appreciate Nixon in Tucson, a desert city with a team playing out its last season in a nearly empty stadium before moving to Reno. And many who were there were fans of $1-a-beer nights and not baseball. It is the end of May in Tucson, it's 100 degrees in the desert, and the beating sun is relentless. On the field, there's a pasty white outfielder with a black Sidewinders cap caked with white sweat rings running the bases, a man among boys. As hot as the weather is, Trot Nixon has been even hotter here. But he is not in the lineup on this night against Las Vegas. The Sidewinders have been told to play the kids at least once a week. Nixon doesn't complain. He'll work out again, after the game. Later, in the air-conditioned clubhouse, he makes a peanut butter and sliced banana sandwich, grabs a drink, and hops up on a table. He's comfortable in his own skin, even if it's a uniform with a logo sporting a snake wrapped around a bat. He's the original Dirt Dog, a Red Sox fan favorite for his hustle, grit, and passion for the game. In 2004, Nixon played a key role in helping the Sox win their first world championship in 86 years. But that was then. "I'm just a man looking for a big league job," he says, the Dirt Dog tattoo on his left biceps showing his true pedigree. And he's happy to see a visitor from Boston. "I just want to know," he says, breaking into a broad grin, "is Manny [Ramírez] really reading books? Is that real?" Nixon shrugs when asked why he didn't make the Diamondbacks. "I started slow," he says. "But those games don't count. If I got a couple more hits in spring training, would that have changed people's minds? I've had some bad springs and good seasons. [General manager] Josh Byrnes knows me from Boston. They know what I'm capable of doing." Nixon says he briefly pondered retirement. "It was one of my options. Do I hang 'em up? Do I go to Triple A? Do I opt out and wait for something else?" He decided to tough it out and accepted the minor league contract. He tried harder. But he was hitting just .214 on April 21, and there were published reports Nixon was distracted, peering into the stands to see if scouts were watching. "I never looked for scouts in the stands," he says. But he doesn't make any excuses. "I struggled a little bit," he acknowledges. "A lot of things play into that. Like, is this really what I want? You're playing in big league parks for a lot of years and you come down to Triple A, the parks are different. There's a whole gamut of things. And you basically have to acclimate yourself." His father, a doctor in North Carolina, flew out to visit him. "It's not like I couldn't hit down here," Nixon insists. "It's just a matter of getting my focus and priorities right and going from there." The Sidewinders started the season 2-17. On May 27, they lost to Las Vegas, the Triple A affiliate of the Los Angeles Dodgers, by more than three touchdowns before just 1,596 fans. The 23-2 thrashing was the worst loss in the team's 30-year history. Manager Bill Plummer, who was a little cog in Cincinnati's Big Red Machine in the mid-1970s (he was the backup catcher behind Johnny Bench), absolutely loves Nixon. "He went 2 for 3 and never gave up," says Plummer. "It says a lot about him, what a true professional he is. He just said, 'Hey, I've been on the other side of those but never on this side.' It's got to be frustrating for him. They pitch around him and he tries to expand his strike zone. He can help a major league ball club, sure. He still has good bat speed, good instincts on the bases. He's slowed down a little bit in the outfield, but he still does a lot of good things." Nixon took the loss in stride. "I remember when we did it to the Marlins," he says, referencing a game June 27, 2003, in which the Red Sox scored 14 runs in the first inning en route to a 25-8 win. "It's not fun. But it doesn't matter if it's three people out there or 35,000 people. You've got to keep it together. Be ready from a defensive standpoint. You've still got to focus. You still get your at-bats. "If you start thinking, 'I'm tired; this is over,' then you've got no chance. Hey, we won, 12-7, the next night." Nixon says his back, which troubled him toward the end of his time with the Sox, is fine. "I've been healthy," he says. "I feel like I'm right where I want to be. I feel good at the plate. I feel good in the outfield." In a career in which he's earned more than $30 million, Nixon says he doesn't need the money. "None of this is financial," he says. "If I didn't love the game, I wouldn't be here in Tucson right now and my family 2,000 miles away from me. I love baseball and my boys do, and my wife enjoys the game. I just wanted to be able to exhaust the opportunities I had. After I do that, if the decision comes to hang 'em up, then I'll hang 'em up. Baseball wasn't always going to be there forever." He says he doesn't know what he'll do next. "Maybe help somebody get better in baseball." He figures someday he'll be a 50-year-old playing in a softball league. Seniority has its perks, too. Nixon gets the reclining chair in the clubhouse, and gets the first seat on the team van. He also gets his rest on the first day of road trips, which typically start with 5 a.m. wake-up calls and feature flights with bad connections. He's as loose as when he used to put shaving cream pies in Martínez's face. "I don't ever want to be a cancer in the clubhouse," he says. "You spend more time with these guys than you do your own family." "All I can do is control what I can control, and that's staying healthy and keeping doing my thing out there on the field. Just playing baseball, that's all I'm doing." He hit .361 his last 10 games, boosting his average to .322. Nixon was on the field when the call came in that his little town blues were fading away. His family, which had just joined him and still hadn't got used to the time change, spent the night packing. The Mets wanted him right away. On June 14, Nixon traveled for 12 hours and got to Shea Stadium 25 minutes before game time of a Saturday rainout. On Sunday, embattled manager Randolph gave Nixon a choice to start in left or right field. Nixon, of course, chose right. Besides getting two hits, he accomplished something he hadn't done since 2005 with the Red Sox. He stole second base. "I think it was a 3-2 count, one out," he says. "Obviously, I haven't had many opportunities where they wanted to run, but sometimes when you go to some of these talented teams, they want everybody running. I just took off. I was just glad I saw the sign and got it right. I didn't even realize it till the next day." Nixon has relocated his family to New York. The Mets have issued him No. 6. With Cleveland, he wore No. 33, chosen by his son Chase. He can't wear 7, his old Sox number - that belongs to shortstop Jose Reyes. But those numbers don't mean as much. "I just took what they gave me," he says. Before a recent game against Seattle, he hit the weight room, talked with batting coach Howard Johnson, but still went 0 for 4, striking out twice but also being robbed of an extra-base hit. "That's what I feel kind of upset with," says Nixon. "I was feeling so good in Triple A and then coming up here, and all of a sudden, I'm like hitting some deep bumps. I don't feel like I'm a total wreck by any means, but I've just hit a few bumps."